What is the IRISS Mission? The fourth of ESA’s ‘Class of 2009’ astronauts to fly, Andreas Mogensen from Denmark is well into a ten day mission to the International Space Station. With a background in aerospace engineering, he has spent the last six years training with the Station’s international partners for his inaugural spaceflight, taking part in a wide variety of activities to prepare him for the IRISS Mission. IRISS is a combination of Iris and ISS, the International Space Station. Iris was the the messenger of the gods in Greek mythology, and the personification of the rainbow. As such, Iris represents the connection between humankind and cosmos. The wings of the logo represents the wings of Iris, but also represents a Viking ship. For Andreas, the 6 stars represent his 6 years of training for the mission. Last week, the thousands of hours spent culminated with the launch from Baikonur, Kazakhstan on September 2nd, 2015 at 06:34 Danish time. The Soyuz TMA-18M was coupled to the ISS Space Station at 12:48, and we expect him to land on September 12. 2015 with TMA-16M. The whole project is described in detail on the Danish site rumrejsen.dk. 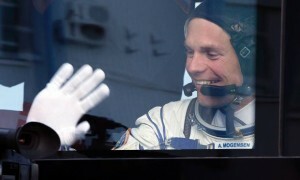 Andreas Mogensen describes himself as an astronaut, a cavenaut, and an aquanaut. Obviously, he has spend a lot of time in the air, and in various full-scale replicas of the ISS Space Station, the Soyuz rocket etc. But he has also, as part of his training, explored a cave in Sardinia for 1 full week, and been working in the worlds only underwater R&D facility, in the Aquarius underwater habitat outside the coast of Florida. What are the Risks Associated with Space Exploration? The Soyuz rockets have been in use for almost half a century, and are the most used space vehicles in the world. Soyuz have contained more than 1,700 manned and un-manned launches – much more than any other rocket. In innovation terms, one could say that Soyuz is a so-called dominant design, and it is characterised by low cost and high reliability. When that is said, nobody has any doubts that space exploration is associated with risks – serious risks. Regardless of the track record of Soyuz, quite a few astronauts and cosmonauts have paid the ultimate price in order to fulfil their life dream. To this date, around 550 people have been in space (200 have been in the ISS mission), and 32 have lost their lifes, that is 1 out of 17. In comparison, over 250 have died on Mount Everest, out of 4042 that have climbed the mountain, that is 1 in 16. The statistics for motor vehicle casualties is 1 in 140, and for air transport the death toll is 1 in 55.000, calculated as so-called lifetime risk. Source: Risk of death and transportation. Climbing Mount Everest 16 1,1 times more risky than S.E. Motor vehicle driving 140 8,2 times less risky than S.E. Air transport 55000 3235 times less risky than S.E. No doubt that Space Exploration is dangerous, but it is thought-provoking that driving a car is only 8,2 times less risky. And yet, everybody that I know who witnessed the Challenger disaster on the news will ever forget that. It’s right up there with 9-11, Chernobyl, and the Palme assassination. And that’s a key point, I think: In Space Exploration, there’s no such thing as operating under the radar: The whole world is watching, in success as well as in disaster. On the site 26 NASA Inventions That We Take For Granted Everyday… there is a similar list, including e.g. CAT Scanners, the joystick, and space blankets. Glancing over the Space List and the WW2 list, it would appear that the WW2 inventions are more radical than the Space inventions – and that many of the uses from Space inventions are consumer inventions, adapted from the original inventions. The WW2 inventions, on the other hand, seem to be B2B inventions for the most part, and inventions that can be recognised pretty much from the original inventions. These days, the fact that refugees are coming to Europe is stirring heated debate everywhere. A tiny fraction of the many Syrian refugees has made it to Greece, Germany, Denmark, and other European countries. These people are fleeing from life-threatening situations in their homeland. Part of the space exploration program, e.g. the Mars program, is to colonise other planets with earthlings, in case the Earth becomes uninhabitable, due to environmental, nuclear or other disasters. Perhaps it is time that we put some of our creative juices into the development of innovative solutions for the explorers that are crossing the frontiers here on Earth – instead of pretending that this challenge is not a concern of ours. It would definitely serve our planet better, if my PhD Turkish taxi driver was not driving a taxi – he could be a much happier citizen if he was given the opportunity to put is PhD to relevant use. We may not be able to afford a 6-year intensive training program for our Turkish PhD taxi driver as the one our Danish PhD taxi driver has been through – but we must do better than just accept that his education is wasted on driving people to and from the airport. And the whole taxi business is being disrupted by Uber anyway, so we might as well embrace that change, right here, right now!